A rugged, reliable, and cost-effective solution for broadband communications that you can rely on when it matters most! Your vehicles and vessels are the first on the scene in critical situations; make sure they are equipped with the Internet and voice services that are essential to your crew’s success in a variety of demanding environments. 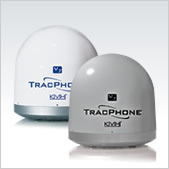 The compact, rugged TracPhone V7 relies on the mini-VSAT Broadband service and its spread spectrum satellite technology to offer on-the-move access to high-quality broadband data connections and multiple lines of enhanced VoIP telephone and fax* service optimized for satellite communications, and service costs as much as 90% less expensive than other services. Equip your ships and your crew with the Internet and voice services so critical to their morale and safety. With the TracPhone V7, you can give your crew the tools they need to keep your operations running smoothly as well as a connection to home that will help keep your crew motivated during long periods at sea. The TracPhone V7 offers the kind of service you need in an emergency situation – it’s reliable, easy to use, and allows you to stay up to date even when cell towers are down and land lines are out of service. Best of all, the TracPhone V7 works whether your vehicle is parked or hurtling down the highway, enabling your crew to stay up-to-date and arrive informed and ready to act, saving valuable minutes when time is crucial. If you need to switch easily between multiple TracPhone satellite communications systems, KVH also offers an optional Service Selector. This simple solution allows you enjoy the benefits of both the mini-VSAT Broadband and Inmarsat services when you need them..
* Faxing over Internet Protocol can be unreliable at times, therefore KVH highly recommends that those customers who demand an enterprise-grade fax solution should take advantage of our optional accessory - the UCH-250 Fax Server.